Home › News & Comment › Family Justice Council's Annual Debate: What’s wrong with covert recordings? 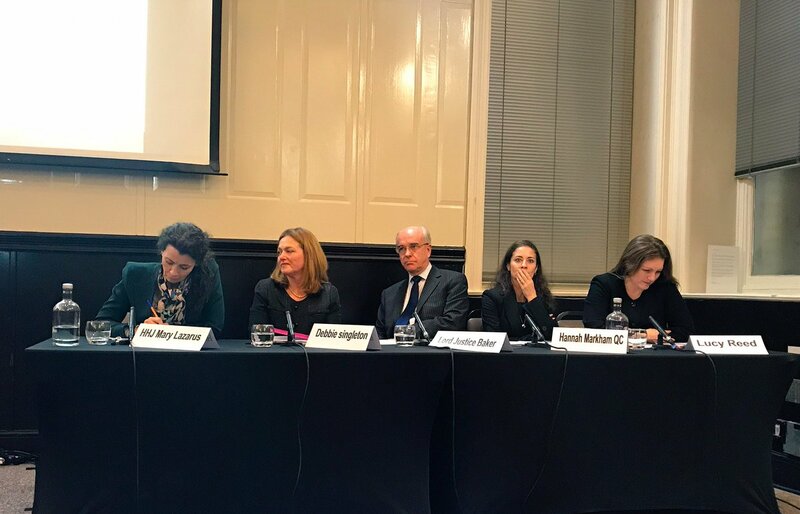 Lawyers, judges and family law professionals gathered 3 December in Leeds for the Family Justice Council’s 12th annual debate. The main issue of this year’s event was covert recordings. Given rapid developments in audio and video technology in recent years, it is increasingly an issue that judges, lawyers, social workers and (divorcing) parents are faced with. Chairman Lord Justice of Appeal Jonathan Baker introduced the speakers, which included children law barrister Lucy Reed, Her Honour Judge Mary Lazarus, Hannah Markham QC and Debbie Singleton, director of legal services at NYAS, a charity that offers information and advice to children, young people and vulnerable adults. Lord Justice Baker opened the debate by saying that "if you had asked me 5 years ago whether covert recordings would be acceptable in family law, it would have been a no. But times have changed, attitudes have changed, myview has changed." After briefly explaining today’s theme,'nothing to hide: what's wrong with covert recordings?' he announced that Lucy Reed and Hannah Markham would defend the motion, while HHJ Lazarus and Debbie Singleton planned to speak against it. Reed told delegates at Leeds' Met Hotel that she conducted some informal research via Facebook and Twitter. "The volume of responses speaks for itself," she said. Reed explained the role and behaviour of divorcing parents, particularly how they act and what they share throughout the process. Many parents feel the need to record meetings with social workers, children, lawyers and other actors, sometimes even secretly, she went on to say. Next up was Lazarus, arguing against covert recording. She summed up a range of considerations, including legitimacy, editing and faking, motivation, lawfulness, data protection, admissibility and relevance. "Now we come to my keyword, perniciousness," said Lazarus. "[Covert recording] is toxic, distorting, creating distrust and open to misuse," she noted, adding that "it creates a culture of distrust, and possibly misleading or negative publication." Markham, however, defended the use and admissibility of covert recordings. "We are all talking about the subject in the same way … but I want us to think about the real problems when a client walks in and says 'I have recorded every meeting'." The final speaker, Debbie Singleton, of the National Youth Advocacy Service, looked at recordings from the perspective of the child. She pointed out that there are different types of recordings, namely from children, parents and professionals. "It is almost always likely to be wrong for a recording device to be placed on a child for the purpose of gathering evidence in family proceedings, whether or not the child is aware of its presence." During the Q&A that followed, there were a number of highly emotional statements and personal accounts from (grand) parents who shared their own personal experiences with covert recordings. Most of them fiercely defended the use of recordings, particularly in relation to social workers and judges. Some attendees made clear that they have an issue with transcripts. One delegate noted that judges need to approve transcripts and this raises trust issues. However, Reed pointed out there is a difference between hearing and judgment transcripts, “only judgments are subject to approval,” she said. The evening was closed by Sir Andrew McFarlane, president, who said “it was absolutely right for the Family Justice Council to address this issue,” given technological developments and “the difficulties we all face” with regards to this relatively new phenomenon. Covert recordings: what should family lawyers advise?